The translators network ProZ.com recently published an article about the use of CAT tools in the industry. It was based on a survey they ran within their community and which received over 3,000 responses. Apart from the perennial dominance of Trados which about 75% use in some shape or form, 3 facts caught my attention. First, the translators’ preference: while 43% said Trados is the CAT tool they use the most, only 36% cited it as their favourite tool. Compared to this Wordfast, second in line in this survey, showed the same proportion of primary users and supporters. memoQ seems even more popular with substantially more people citing it as their favourite than actually use it as their primary tool. The second point was the real deciding factor in the choice of CAT tool: the main driver, listed by over 45% of respondents was customer requirements, with market research second at about 36%. Pricing was at the bottom of the list. Translators usually work with handoffs or translation kits which have been prepared for them by their clients. When they don’t start from the raw source documents, they have a more limited choice in the translation technology. They also quite commonly download packages from Translation Management Systems, and are tied into the CAT tools supported by the workflow. Finally in some cases they are forced by business requirements to the technology of the LSP they are affiliated to. The third and last point I took away from reading the ProZ.com post was that Wordfast and memoQ are the most common CAT tools after Trados. We have talked about Trados many times in these pages, and have covered memoQ on several occasions as well. However Wordfast which is also in the Top 3 of our own never-ending Poll in the right sidebar, was never yet covered on Localization, Localisation. This article will begin to remedy that. Wordfast Anywhere: a web-based CAT tools with Translation Memory, Glossary and Machine Translation functionality. 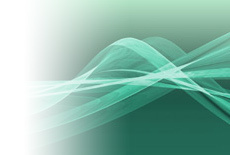 It is available free-of-charge for translators. 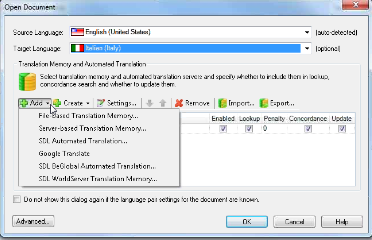 Wordfast Classic: a well-established, Microsoft Word-based translation tool. For readers more familiar with Trados, this is the equivalent to using Workbench in Word instead of translating in TagEditor. Wordfast Server: an enterprise Translation Memory server compatible with the other 3 Wordfast applications. 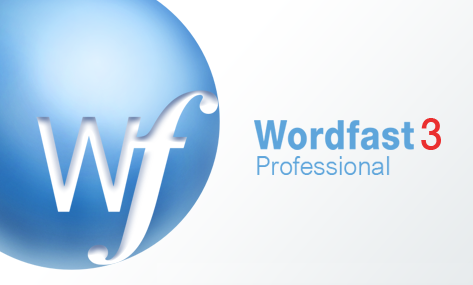 Wordfast Pro: the professional, full-featured CAT tool, flagship of the Wordfast family. One of its main attributes is the extensive platform compatibility: it supports Mac OS and Linux as well as the Windows. Wordfast Pro is the application I will talk about in the rest of this post. 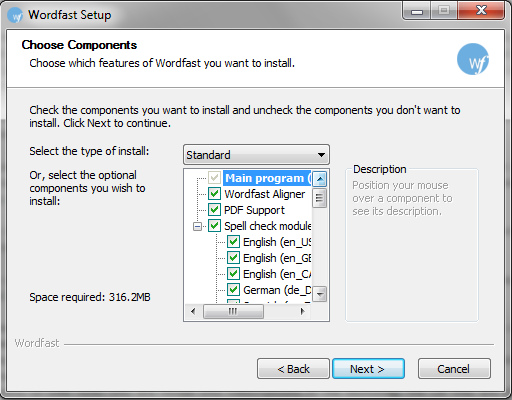 The latest version of Wordfast Pro (3.1.5 at the time of writing) is available for download from their website. The trial version has no feature limitation other than a 500 Translation Units cap in the TM. The installation itself is very fast and requires minimal user input. There is one screen in the wizard which lets you select optional components like the Aligner or PDF Support and choose the Hunspell spell checker languages to install. Wordfast can also use the Microsoft Office spell checker dictionaries if they are installed. On my Windows system, the whole installation process took about 2 minutes. In the Active column of the TM and Glossary lists, select the TM or TM’s to use. 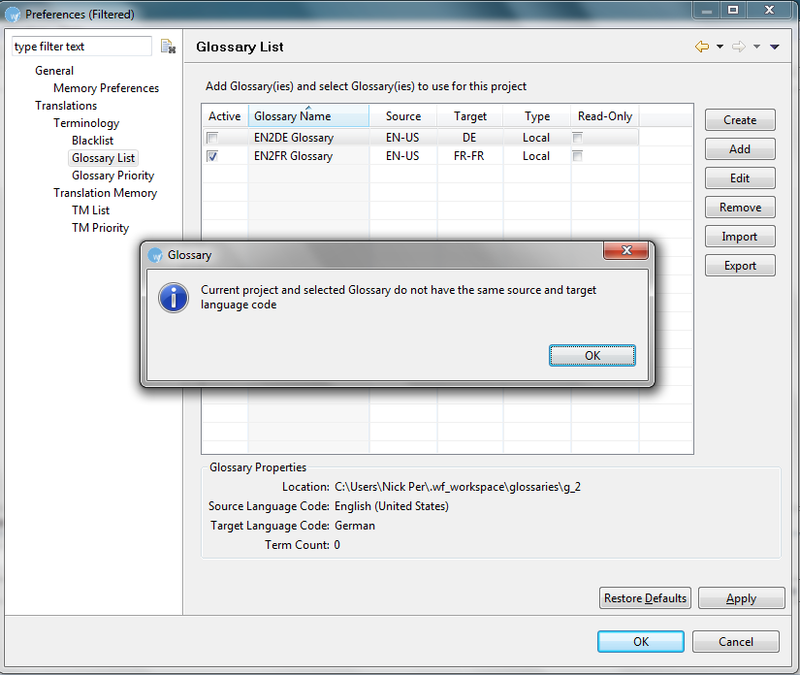 The language pair of the TM and Glossary must match those of the Project. Open the document to translate by pressing CTRL + O and browsing to its location. You are now ready to start translating. Type your translations in the target column for each of the segments. 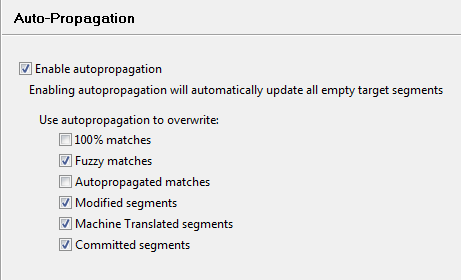 If your TM already contains matches, the best way to proceed is to use the Translate until Fuzzy button (CTRL + Alt + F) to move from segment to segment. 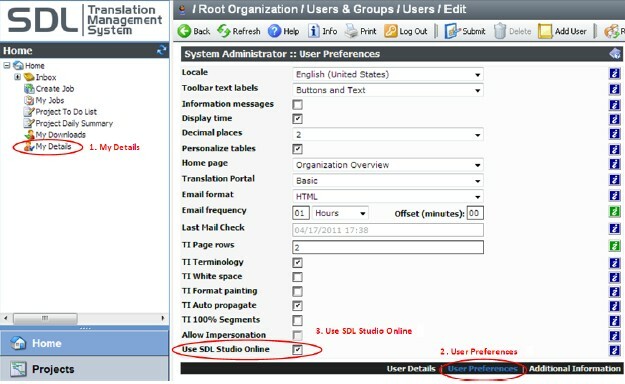 With the translation completed, save your Project (CTRL + S) and generate your translated file (CTRL + ALT + S). To add your translations to the primary TM, select Commit all segments to TM (CTRL + ALT + END) from the Translation Memory menu. Wordfast offers a wide choice of features to enhance translators productivity and improve translation quality and consistency. Most of these options can be accessed by clicking one of the icons in the Tool bar and can be configured from the Preferences dialog (Edit > Preferences). This dialog box and some of its views have a very practical filter text box which lets you hide any feature setting you are not currently interested in. 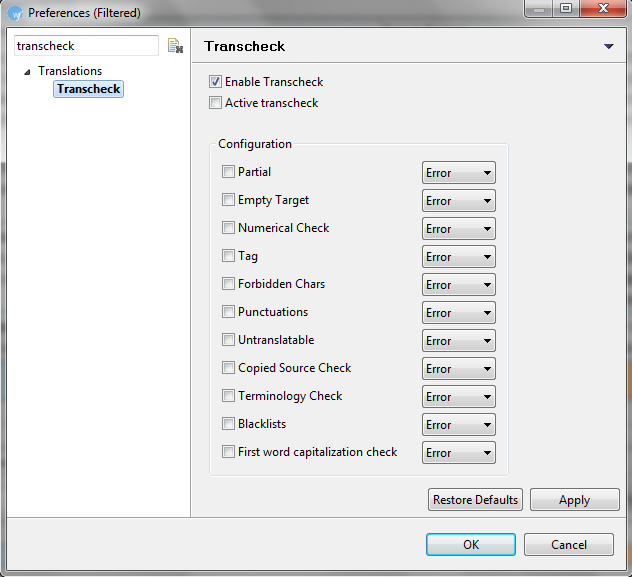 For example, to see the quality control settings, simply type Transcheck in the type filter text field and press Enter. All other Preferences will be hidden from view and you will be able to access the Transcheck options without having browse to them (see Screencap). Some of the most useful UI options available are the configurable keyboard shortcuts found under General > Keys. The optional software Automatic updates are also a neat, non-intrusive way of making those available. 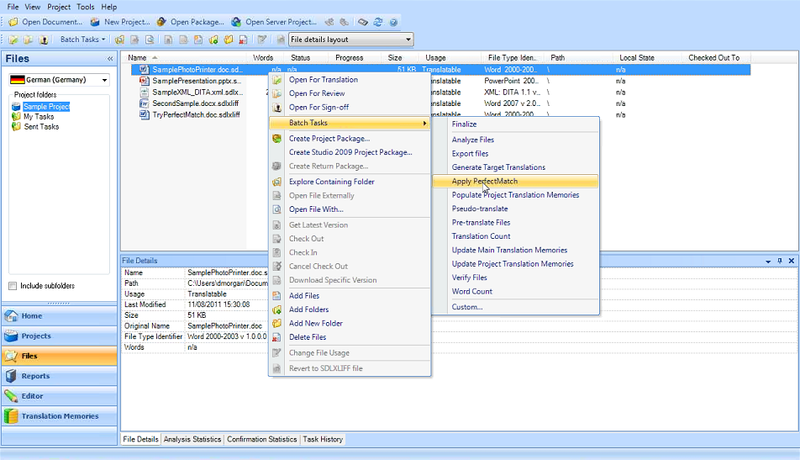 Auto-propagation copies your new translation to any duplicates within the project. This can be fine-tuned to apply only to certain segment types. Auto-suggest, not to be confused with the previous feature, works much like predictive text in mobile phones. Some like to use it, some don’t. Of course it can be switched on or off. Filters list all supported file types. File filters can be duplicated to contain variations of their settings. This works fine, but the way to add support for new file types is not as easy as in other systems. Machine Translation is one of the highlights. 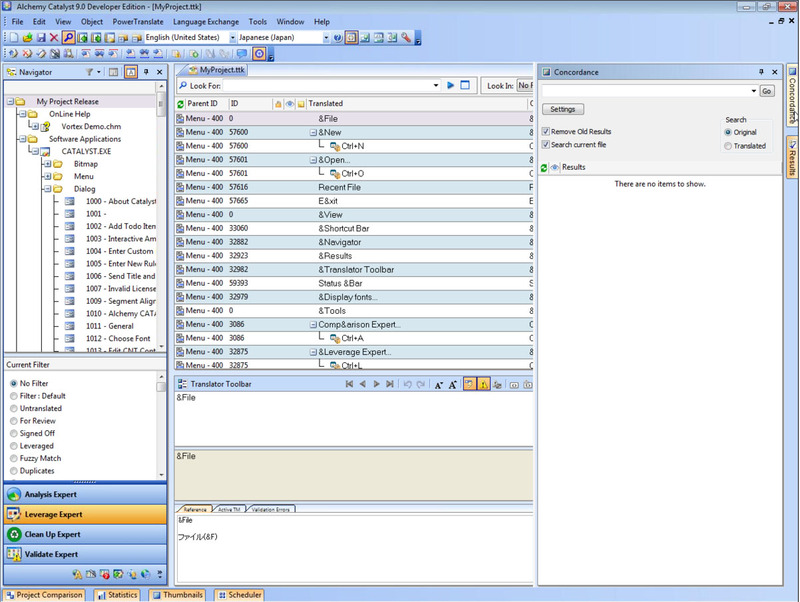 Wordfast can be connected to an existing Google Translate account, Microsoft Translate account, to Worldlingo or to all at once. MT can then be used to provide suggestions when no TM match is found. 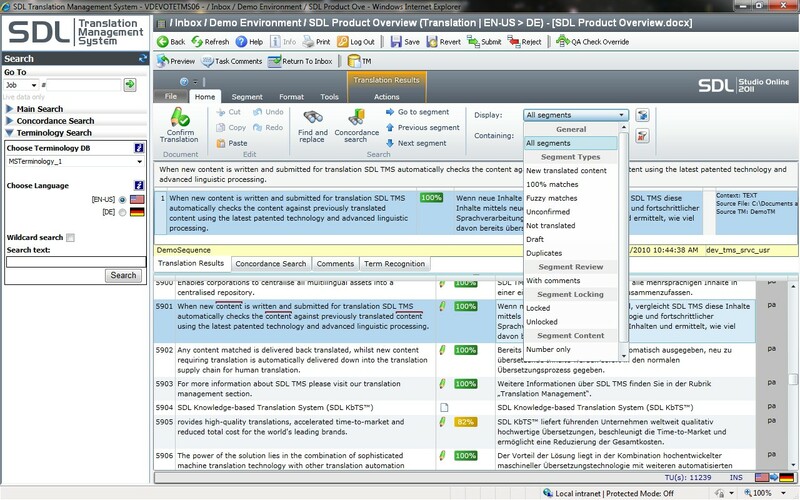 Terminology supports sequencing, blacklists and even automatic fuzzy term recognition. 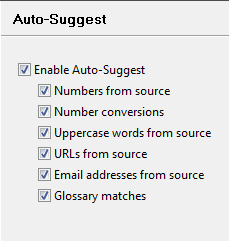 The supported Glossary formats are Tab-delimited (.txt) and TBX. Transcheck is Wordfast’s automatic quality control tool. It comes with an array of options shown in the screencap above. 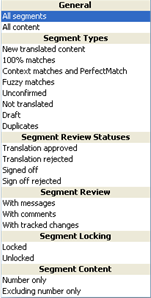 Translation Memories also has a vast amount of settings relating to Sequencing Priority, Penalties, TM Update behaviors etc. By default Wordfast does not pre-populate fuzzy matches, but it can be configured to by editing the minimum threshold. Wordfast TM’s can be exported to a simple txt format or to TMX. Overall the features available and the amount of flexibility in their configuration is on par with the most modern CAT tools around. The only significant limitation in my opinion is the lack of real-time preview. In order to preview your work you will need to generate the translated file (CTRL + ALT + S) and open it in its native application. This may not sound like a big deal, but if you’ve been using a CAT tool which does have real-time preview you won’t want to give it up. 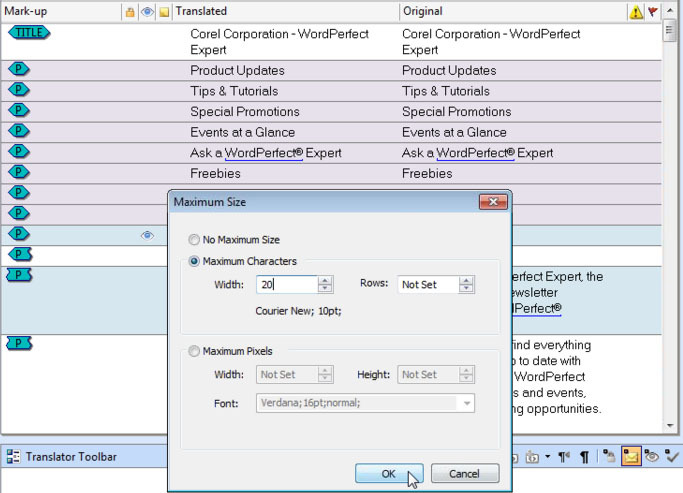 Apart from the TXML Editor we’ve been looking at until now, Wordfast a different has view called the PM perspective. This can be opened by clicking the PM perspective icon below the File menu, and gives access to a number of batch activities useful for pre and post-production. Analyze can be used to calculate the leveraging of file sets against Translation Memories and output reports. Clean-up generates target files, updates TMs, passes on Attributes and reports on the results. Pseudotranslation is a good pre-production tool used to test the content exposed to translation before a project goes to translation. Split/merge divides big projects into smaller, more manageable pieces according to the number of Translation Units or words found in TXMLs. Bilingual export lets you export and reimport the bilingual file into a Word document (with optional track changes), so linguistic review can be performed by Subject Matter Experts in MS Word and automatically incorporated back into the TXML by the language team. Show/Hide 100% lets the pre-production team exclude 100% matches from the handoff. 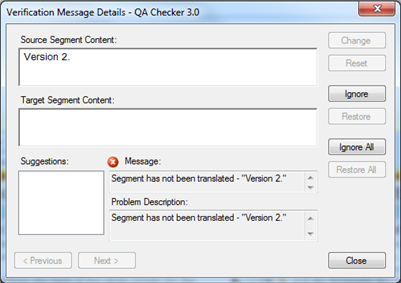 Transcheck creates QA reports based on the same options available in the TXML Editor. Swap Source/Target does just that. The user interface here is easy to get used but maybe a bit outdated. The shortcuts to Preferences in each screen are a good idea and the Bilingual Export sounds very practical. 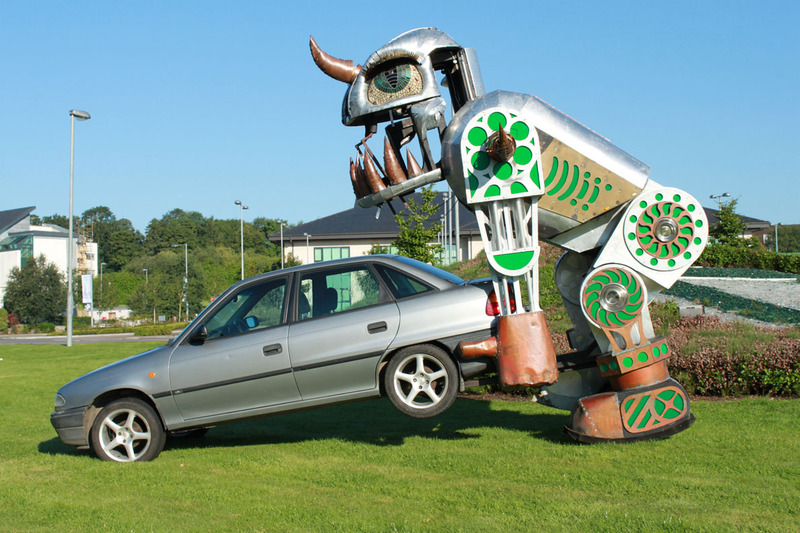 XML in Localisation: What can it really do for us? Have you ever wondered how xml could possibly be relevant to our needs? Localising xml files is pretty much straight forward. But what of using XML to localise? As localisation professionals we’ve all known about XML for quite some time now. We understand that as a Markup Language, it is closely related to HTML. We also know that it is Extensible, meaning that the tags and structure are user-specific. This gives us the picture of a very powerful and flexible language. But I’m sure we also all have come across an xml-based document (a “.xml file”), which we have launched in our favorite browser, only to be treated to a pretty unattractive page of…XML code! So what can that powerful and yet somewhat undefinable animal really do for us? 1 master document – the product sheet – was created for each new product released. 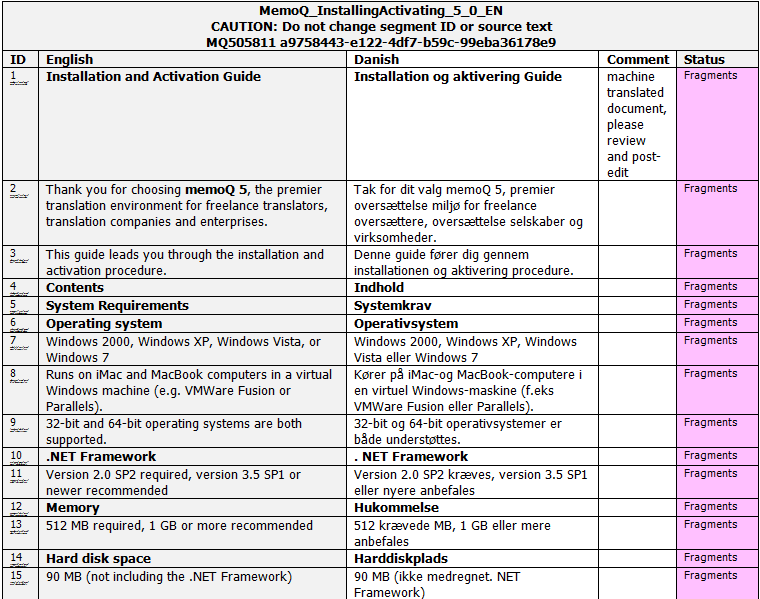 The product sheet was localised into 13 languages. Relevant sections were pasted individually into the website for each language. Relevant sections were also pasted individually into a printable version which was converted to PDF again for each language. The localised doc files were also circulated. Copying and pasting made the process extremely time consuming and error prone. No translation memory system was used, making leveraging impossible and quality control of the localised content solely reliant on proof readers. The Localisation team was handed over the responsibility of localising this content mainly to free-up Marketing resources. Rather than simply taking over, they identified opportunities for improvement and initiated an R&D effort in xml Single Source Publishing. The goal now was to automate as much of the process as possible, and free-up time within the agreed standard turnaround for systematic quality control. Product sheet created in xml by the authors, using the free WYSIWYG XML authoring tool Altova Authentic®. The xml schema was designed to be compatible with the web content management system used to create localised product pages. A Trados ini file was created to parse out all non-localisable content in the xml code. 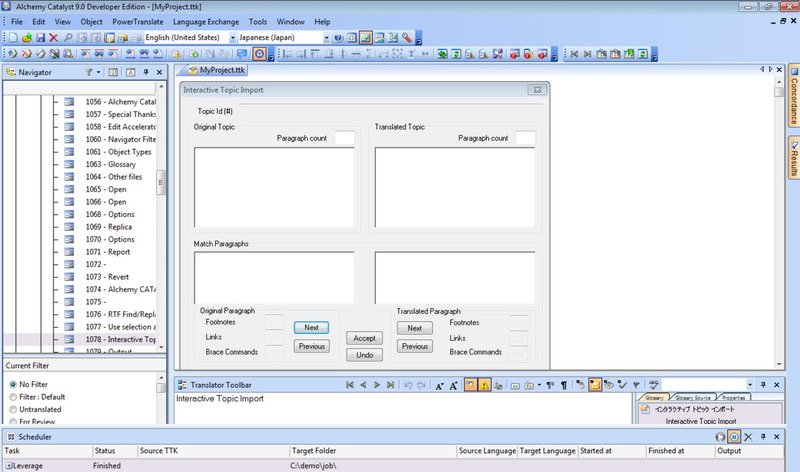 XSL Transformation and Apache FOP were used to automatically generate all localised XML, HTML, RTF and PDF copies after post-translation processing in Trados. 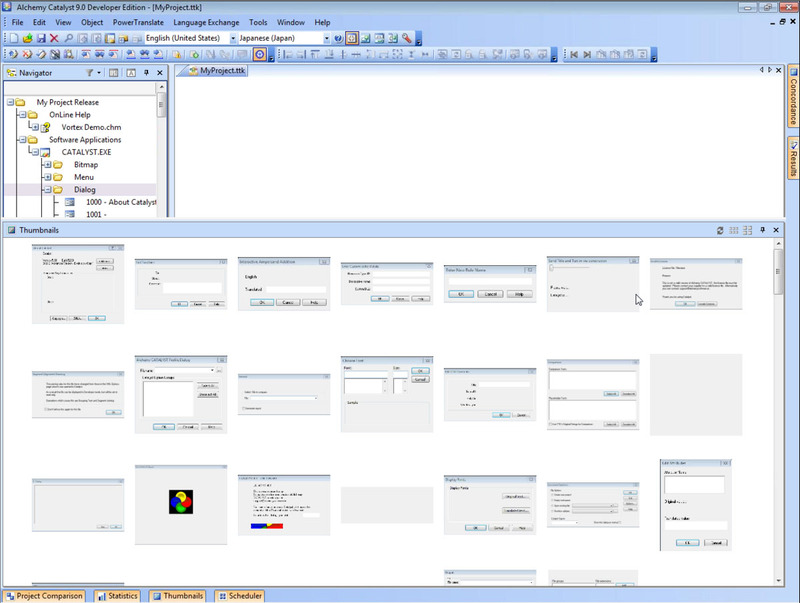 A VB Developer created a tool to manage all Altova StyleVision®-based automation from one single UI. Upload of complete xml product sheets to the website for each language rather than copying and pasting independent fields (unfortunately batch upload was not permitted by the web content management system). Internet team saved 75% on the time required for localised product webpages to go live. Other content types were all published simultaneously. Use of Translation Memories and pro-active Terminology Management cut cost and increased consistency. Thorough Quality Checks were also processed in batch using QA Distiller™ which helped catch multiple terminology and value errors before publication. The key to the success of this new setup, apart from choosing to use XML, was the ability to revise the process from beginning to end. Because the Localisation team were allowed to have a say in the authoring process, efficiencies were generated on the whole span of the Marketing and Web content creation and XML Single Source Publishing was successfully implemented. When I started using Catalyst, I felt Leverage Expert was more of a batch tool and Update Expert was only for small updates. is it a new project or an update? are there many files to update within each TTK? are these files Win 32 executables? are the changes functional or do they impact a lot of localisable strings? Let’s look into typical workflows to see how they best respond to our needs. Import all the localisable source files. Duplicate it to the number of target languages. Rename them using language codes. 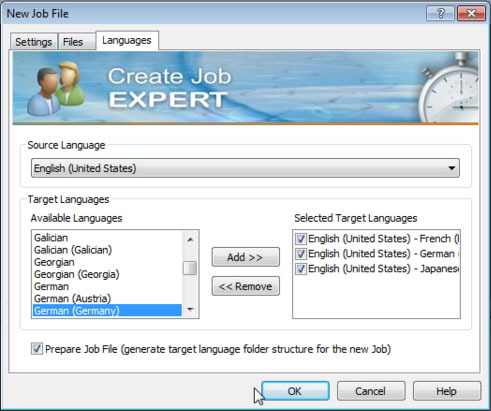 Set each file’s target language. Leverage from all the relevant repositories of previous translations. Update the status of every string in the TTK to Signoff or For Review as required. 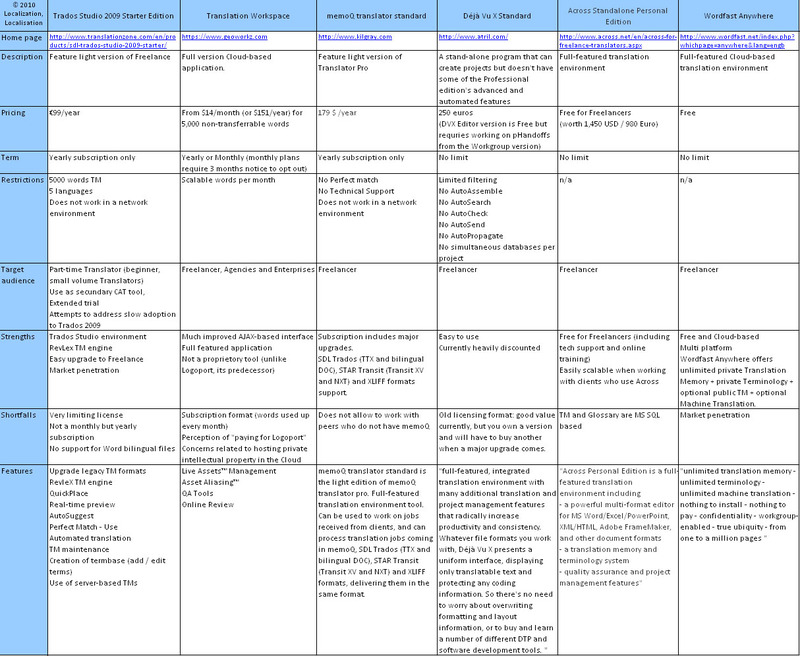 Copy previous version of each localised TTK. Update name by incrementing version number (e.g. from__.ttk to__.ttk). Update the application file(s) which have been changed in each localised TTK. 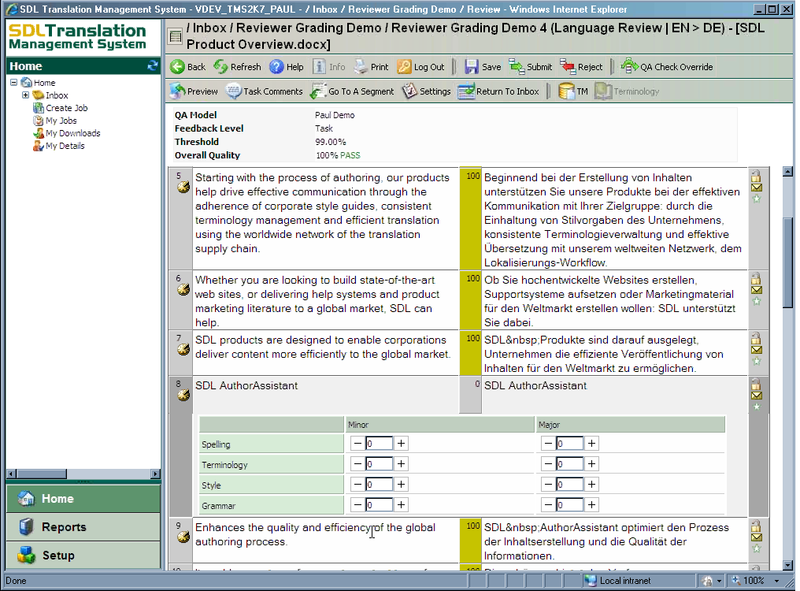 Use Leverage Expert if required to reuse translations from sources other than the previous TTK. Update the status of the strings marked for review only. When working with several target languages, each TTK containing a number of files, with regular updates, and if you keep you string status tidy, I think Update Expert turns out to be more efficient in the majority of cases. I would estimate that if less than 10% of the files in a TTK need to be updated there is a lot to gain in ensuring that every string which was signed off in the previous version does not have to be signed off, or even reviewed, again. 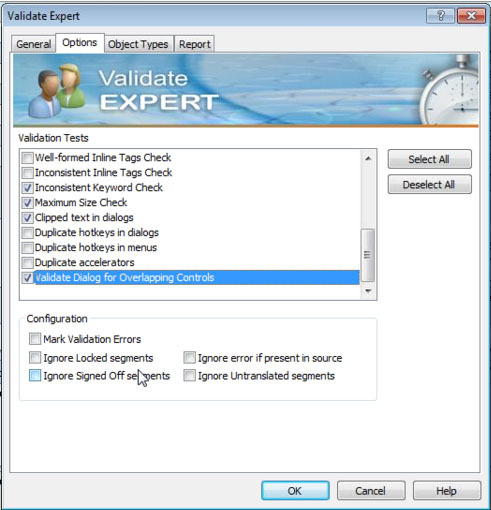 It is much easier to differentiate which have been updated when using the Update Expert. Importing application files into the English TTK. 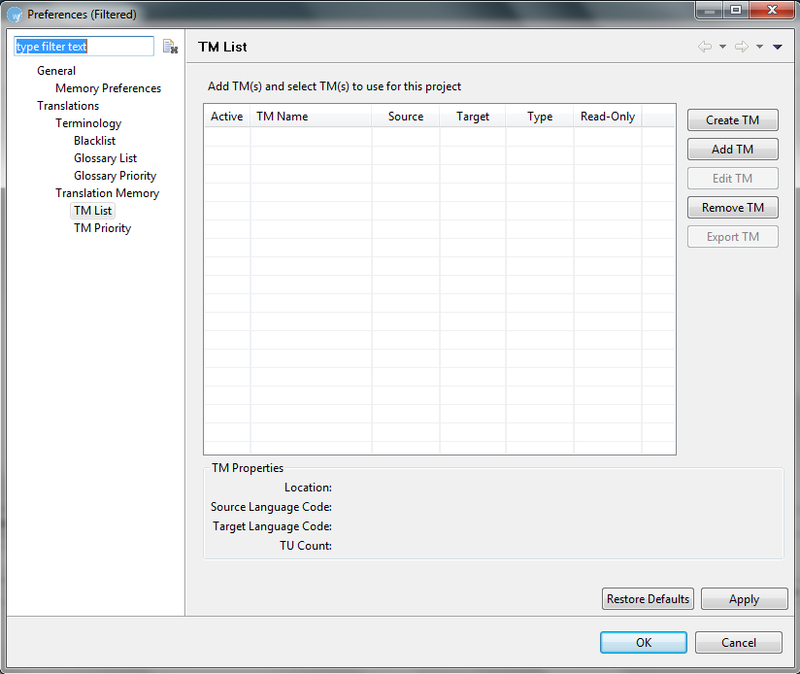 Setting target language in TTK and each application file. Using Technical Support Advisors (TSAs) to produce Knowledge Base content is a logical choice: they are in-house native speakers with unbeatable product knowledge, who can produce source and localised articles at minimal additional cost if they can work around their other duties. 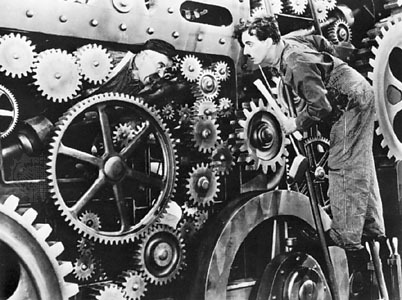 What can be overlooked in such a seemingly efficient setup is Translation Memories (TMs). This case shows an example of such a setup being integrated with Trados TM technology. English articles were produced at a sustained pace by a team of dedicated technical writers. TSAs were involved with their review and the creation of some English articles. Translation would be undertaken by native speakers in TSA, when time allowed. Percentage of translated articles was low and loosing ground. Lack of version tracking meant English articles may be updated several times before translation work started. Reusing existing translations and updating existing articles was tedious, and sometimes led to the re-translation of entire sections or documents. There was no terminology control and references to UI terms (e.g. OS or software strings, firmware messages etc.) were entirely ad hoc. 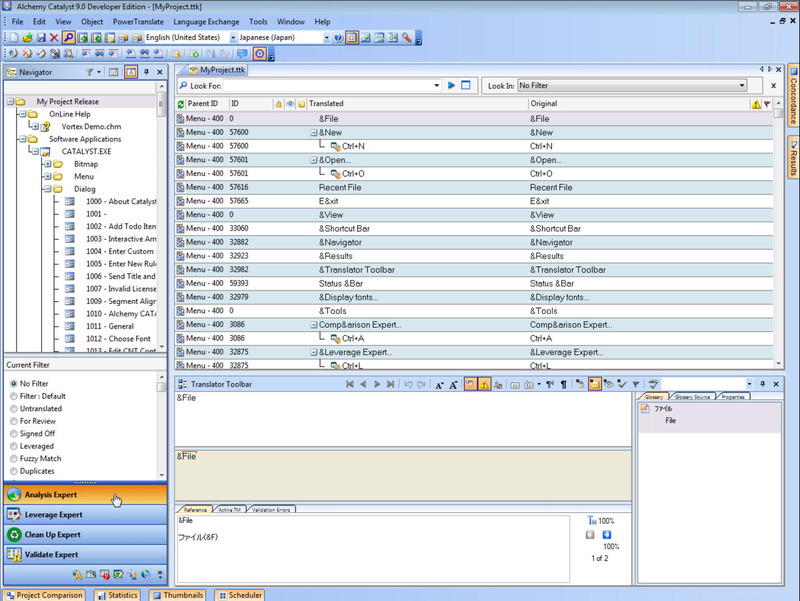 The corporation setup a Trados Network License Server as part of the Trados 2007 update. Thanks to the different time zones involved, a sufficient number of Trados licenses was available to equip the Technical Support translators. Initial training and a reference manual was provided. 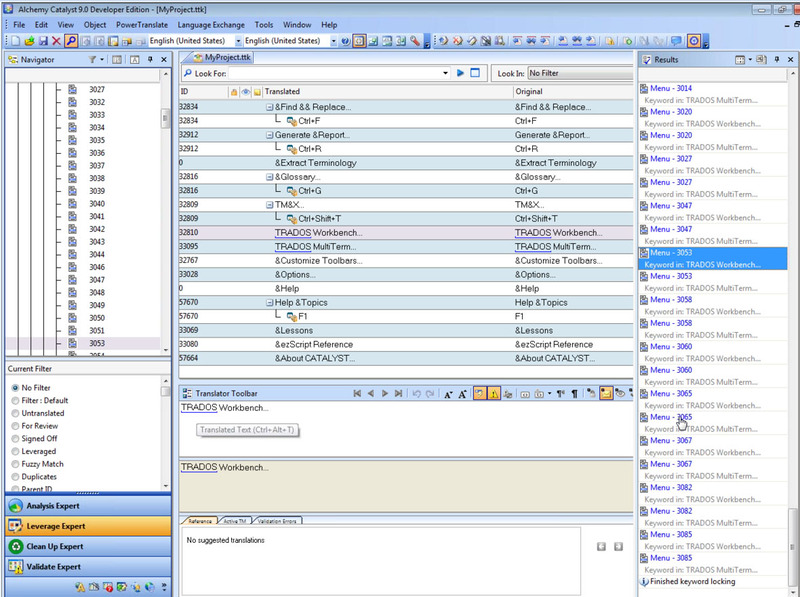 A Termbase was loaded into Workbench to provide integrated reference across content types. 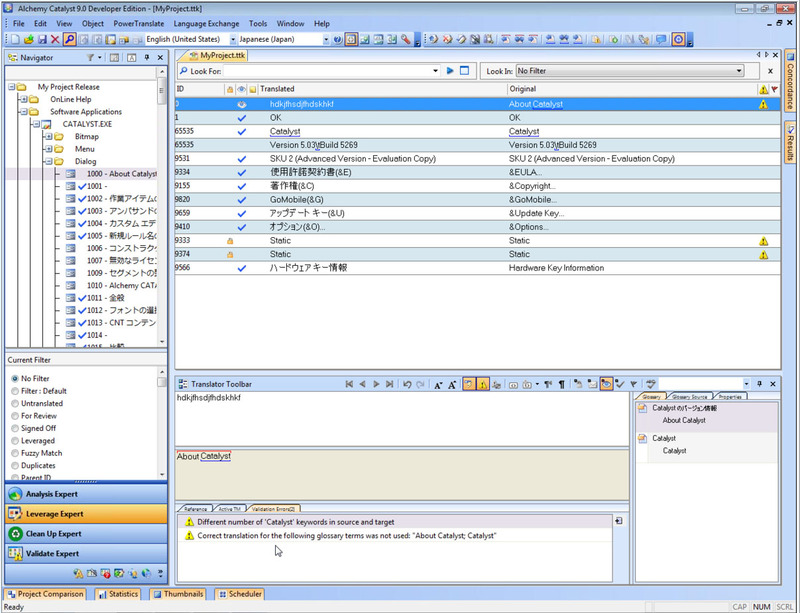 Some Winalign work was also done to start populating the Knowledge Base Master TMs before Trados-based translations even started. An engineer was assigned to run TagEditor Verifiers and QA Distiller checks on the new translated content to help increase overall quality. The gap between the English and localised Knowledge Base narrowed, especially for the most viewed cases. The quality and consistency of the articles increased. The pace of translation increased. The setup was used beyond its original scope, supporting updates to the parent corporation website. Substantial cost was saved and projects delivered which would not have received cost approval necessary for outsourcing. One of the things which made this project a big success was its negligible cost. The investment was null since the whole setup was based on better utilising existing resources. In such a scenario, the cost of a full-blown Global CMS system would have been impossible to justify..